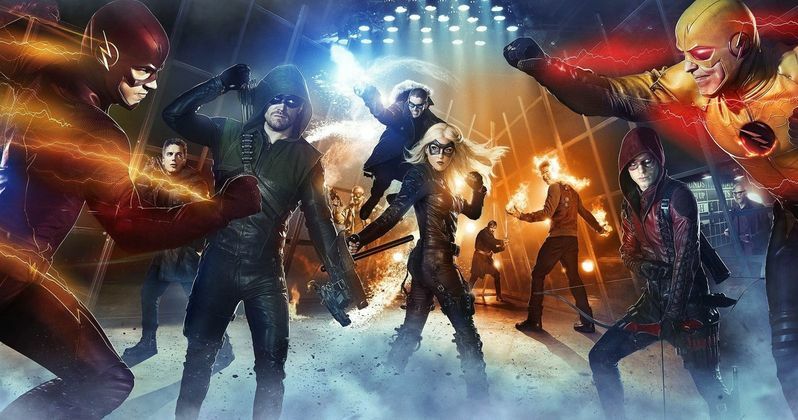 We know that Legends of Tomorrow is planning to introduce a huge DC Comics character in the final moments of its Season 1 finale. We also know this character will be played by Patrick J. Adams. What we don't know is who he'll be playing. It was rumored that he'd show up in costume as Booster Gold. That might not be true. As a new rumor claims, he's actually playing someone a tiny bit more popular. Well, the suit is more popular anyway. Bleeding Cool has it on good authority that Patrick J. Adams is set to appear as Green Lantern on the hit CW series Legends of Tomorrow. But he's not playing Hal Jordon. And, obviously, he is not set to take on the role of John Stewart. Both of those characters are reportedly being saved for the big screen reboot Green Lantern Corps., which arrives in 2020. No, Patrick J. Adams will be playing 40s era Alan Scott. Alan Scott was more recently reintroduced in DC Comics' New 52 continuity storyline. This version of Scott is younger and gay. Though, with its various time travel elements in place, it isn't clear which version of Alan Scott Patrick J. Adams will be portraying. The rumor might not even be on the level, since Booster Gold sounds like the more appealing character, as his backstory makes sense in terms of what is currently happening on Legends of Tomorrow. Booster Gold is a time-traveling super-hero from the 25th Century who uses high-tech equipment to fight crime, alongside his robotic side-kick Skeets. His best friend and most regular partner is Blue Beetle. Not taken very seriously by his peers because of a careless and somewhat egotistical attitude, he is frequently under-estimated. Briefly taking the alias Supernova during 52, he begins secretly working with Rip Hunter as a guardian of the timestream. With Rip Hunter already a key part of Legends of Tomorrow, and the time traveling elements pretty heavy, it definitely sounded like Booster Gold was who we'd be seeing this April. Now, we're not quite so sure. While Patrick J. Adams was just announced as this secret DC Comics character only yesterday, there have been many ideas floating around about his true small screen identity. Patrick J. Adams, best known for his starring role in the USA series Suits, will become a major player in Legends of Tomorrow Season 2. This mysterious DC character is set to arrive in the final moments of the climactic season finale, airing in just a few weeks. A source close to production won't spill the beans on exactly what will transpire. But they did have this to say about Patrick J. Adams' inclusion on the hit CW show. DC's Legends of Tomorrow was recently renewed for Season 2 by The CW. Patrick J. Adams will appear in both the finale, titled Legendary, as well as the DC's Legends of Tomorrow Season 2 premiere this fall. New episodes of DC's Legends of Tomorrow are currently airing Thursdays at 8pm, only on The CW. What do you think? Will you be happy to see Alan Scott's Green Lantern show up? Or were you really hoping to see Booster Gold? Sound off in the comments below.